Gaining momentum and international recognition, the Love and Light movement has earned its way to a variety of venues, main stage opportunities and headlining time slots. The most memorable of which being: BURNING MAN, SHAMBHALA, ULTRA, COACHELLA, WAKARUSA, LIGHTNING IN A BOTTLE, SONIC BLOOM, SYMBIOSIS, ENVISION, RAINBOW SERPENT, THE BOUNCE, EARTH FREQUENCY, and ENCHANTED FOREST. 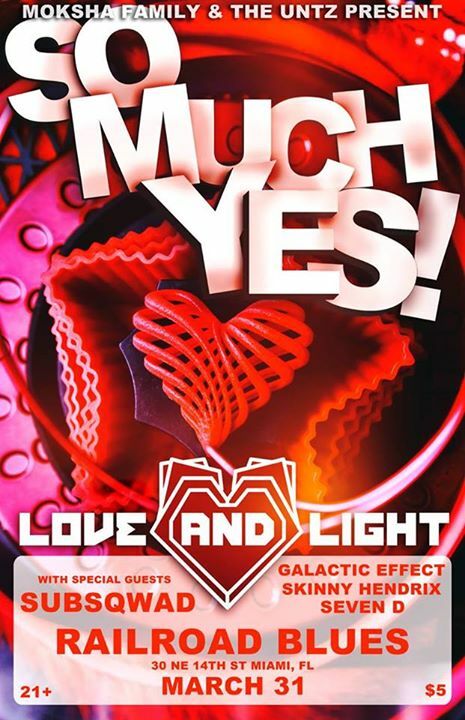 Love and Light aims to break the mold of the dance-music experience by providing a fresh and uplifting take on bass music that, unless you’ve had a live connection with the duo, you’ve never heard before. SubSqwad is Brian Amaral and Kenny Ferron. They create and perform a unique blend of Glitch Hop, World Bass, and Future Funk. Their live performances seamlessly blend genres, styles, & influences. 2013 has seen the release of SubSqwad’s EP “The Light” featuring conscious hip-hop vocals from Chopp Devize and Campaign as well as their release on the compilation “Ethnostep 3” under the SUBBASS netlabel. Their music has been aired on FM radio broadcasts in Miami, Knoxville, and Asheville as well as internet radio shows and blogs from GlobalFunkRadio, Asheville FM, and OMbilikal FM. They’ve performed at music festivals and clubs throughout Florida, Tennessee, North Carolina, Nevada, and Georgia, including iconic events such as Ultra Music Festival, Earth Dance, Burning Man, and Moksha Art Basel Miami beach. Bringing in a cinematic twist to Electronic music.The sounds and performances of The Galactic Effect blend many different realms and styles into one stellar glue.His sound crafting technique incorporates vibrant synthesizers and future bass with orchestral vibes,strings, and other world elements.Arranging music which defies all barriers, genre’s and labels, creating in constant change and movement,leaving the audience curious for the next possibility plucked out of the infinite spectrum of the auditory universe. Seven D’s sound can be described as deep bass lines, heavy synths, and memorable melodies in the context of progressive electronic dance music. His main compositional tool is the piano; countless nights are spent creating harmonic and melodic outlines by improvising. For live performances, he uses a synthesizer to perform melodies while triggering stems to other pieces. Seven D has performed with musical acts like Minnesota, Liquid Stranger, Ott, Bluetech, Mobius 8, Govinda, Phutureprimitive, Breakscience, Android Jones, Mimosa, Telekinetic Walrus, Afrobeta, The Galactic Effect, Warp 9 and many more. Brady Jacob, aka Skinny Hendrix, has become a staple DJ/Producer in the Miami underground bass music scene over the last few years. In September 2013, he dropped his first official release, Feel The Stache EP, and has not looked back, opening up locally for EOTO, Govinda and HeRobust among many other national touring acts and playing shows across the US. His signature DJ mix series, “The Mustache Rides”, has consistently entertained his listeners with its variety of musical styles and expert mixing techniques.